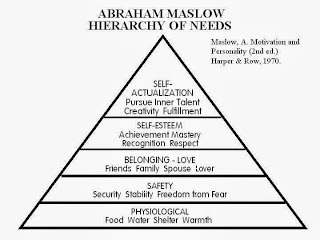 Exposing my inner nerd, I admit that one of my favorite classes in college was a study of Abraham Maslow and his hierarchy of needs. Simply put, he believed that a person is motivated to achieve certain needs and that the most basic needs have to be fulfilled before moving up to higher levels of needs. 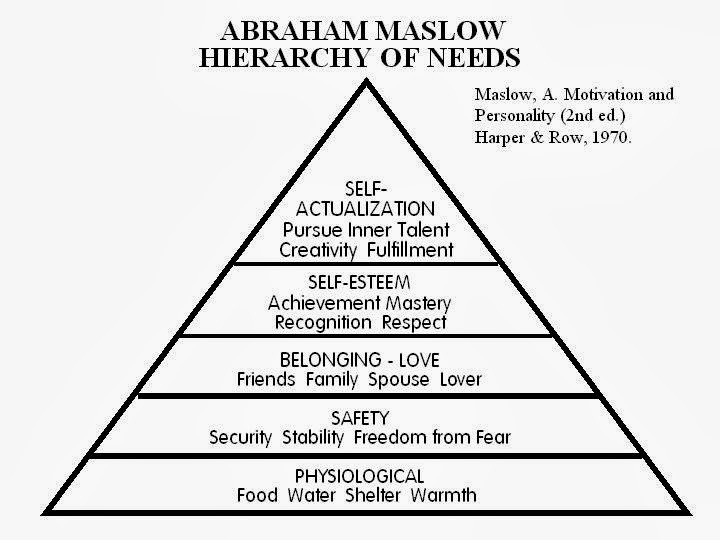 His model is usually portrayed in the form of a pyramid, with the most basic needs (food, shelter, water, air, etc) on the bottom, moving up in complexity until reaching the top level of self-actualization (achieving personal potential and fulfillment). Although critics point out the flaws in his model, there is enough truth in it to be useful in various aspects of motherhood and living in general. Babies are the most obvious example when considering their needs. At the bottom of their little "need pyramid" is sleep, food, warmth, dry diaper, followed by interaction with mother, being held and cuddling, followed by external stimuli etc. A financial "pyramid" would have the basics of employment, shelter, food, warmth, clothing...followed by things like health needs, communication, transportation, followed by education, entertainment, travel, philanthropy etc. When there is an area of dissatisfaction in your life, try to think of the problem in terms of a pyramid. Are the basics taken care of? Whether the problem is housekeeping, diet, your children's behavior, your relationship with your spouse, your employment...your pyramid needs a stable foundation to be strong. Work on shoring up that foundation before moving up to bigger and better things.